In the last few weeks, my human mommy has taken hundreds of photos (only a slight exaggeration) in hopes of getting that perfect picture for our Christmas cards. 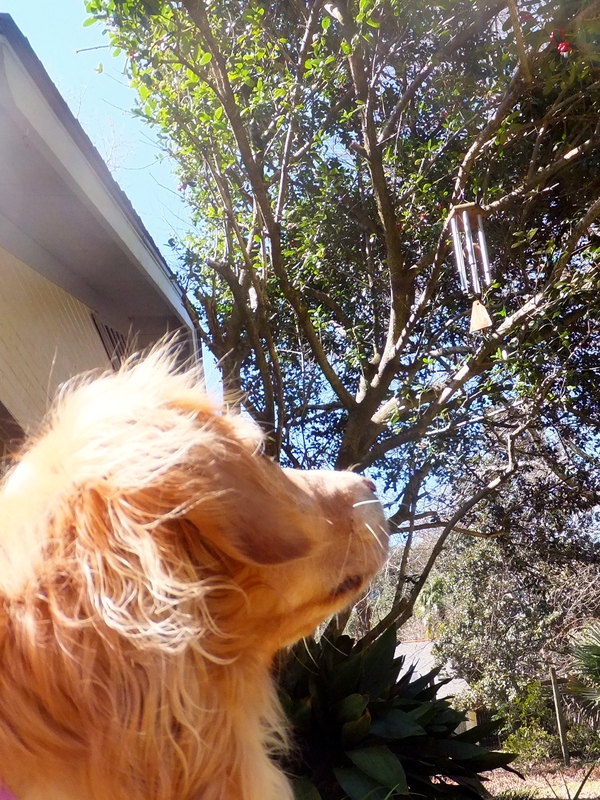 Tallulah Bee and I have humored her, mostly because she bribes us with treats. 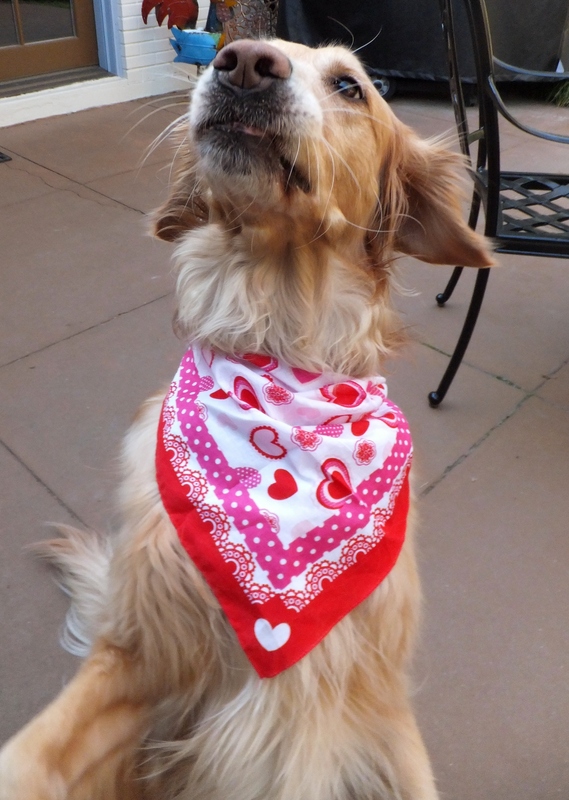 In fact, we purposefully look away from the camera, move slightly, or close our eyes just as she snaps so we can get more treats. Shhhh . . . don’t tell her that. It’s our little secret. Anyway, Mommy managed to get a few favorites along the way and today we begin the countdown to Christmas. 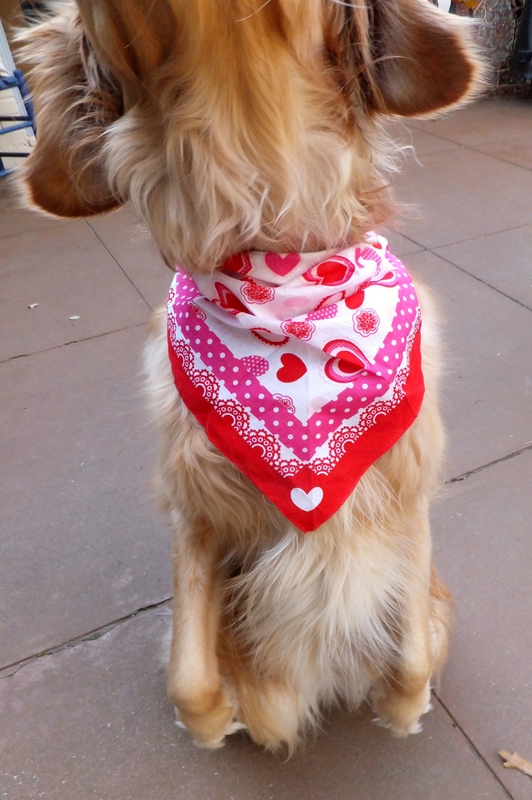 The Bee and I are modeling our gorgeous Geaux Fideaux monogrammed bandanas. If you’re interested in getting your very own Geaux Fideaux original (they’re working on Valentine’s Day and St. Patrick’s Day looks), just send an Instagram direct message to @geauxfideaux. 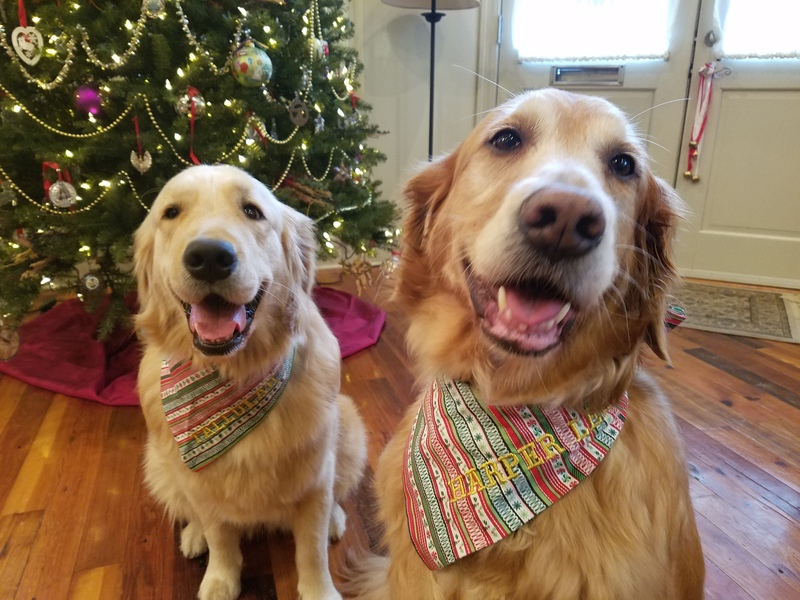 We’re all smiles as we await Santa’s arrival! And on the second day of Christmas . 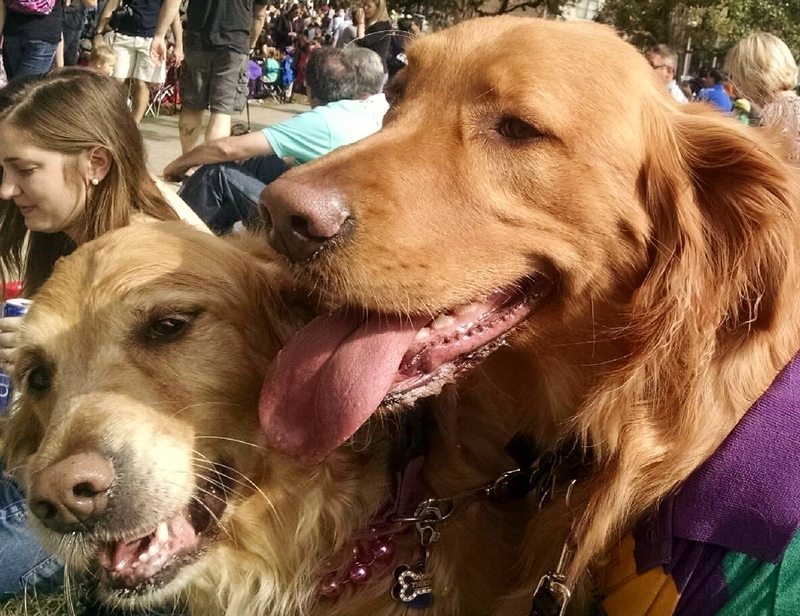 . . my humans and I jumped into my chariot and took a quick drive to New Orleans to meet my Instagram friend @goldenluver, also known as Erika, who’s visiting the Big Easy from her home in Indiana. Naturally, our tour of New Orleans had to begin at my favorite watering hole, The District. We then headed to Grand Isle for a bite to eat and a very nice visit. 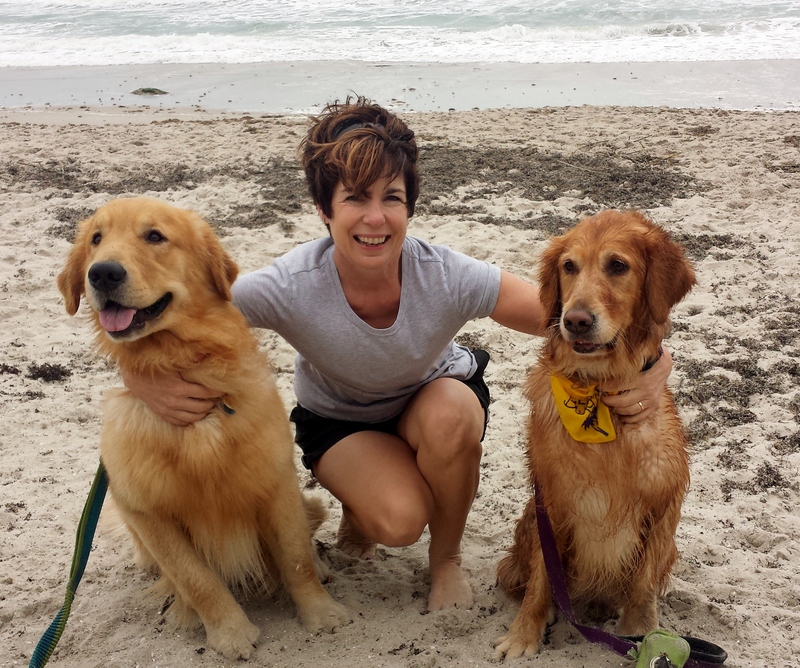 Miss Erika has three sweet Golden Retrievers back home–Bogey, Bear, and Bagus. 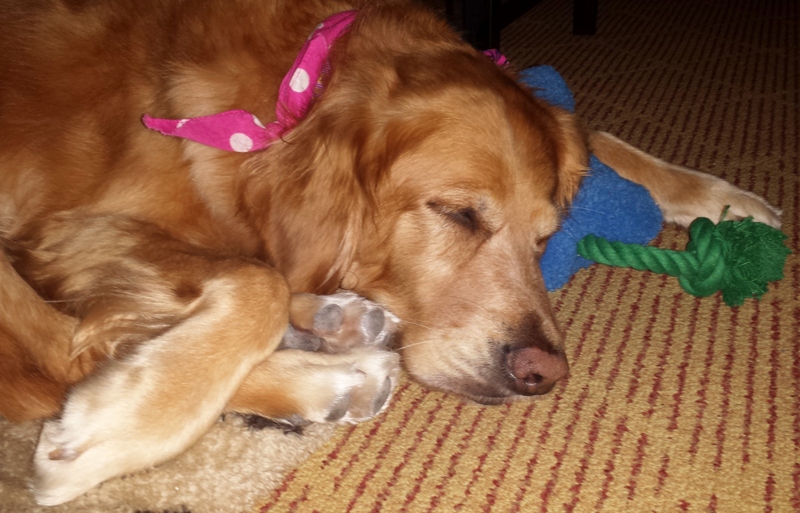 She was having major Golden Retriever withdrawal, which means that I got lots and lots of love and attention. Perfect for me! Then we went on a short tour of New Orleans hotel lobbies. 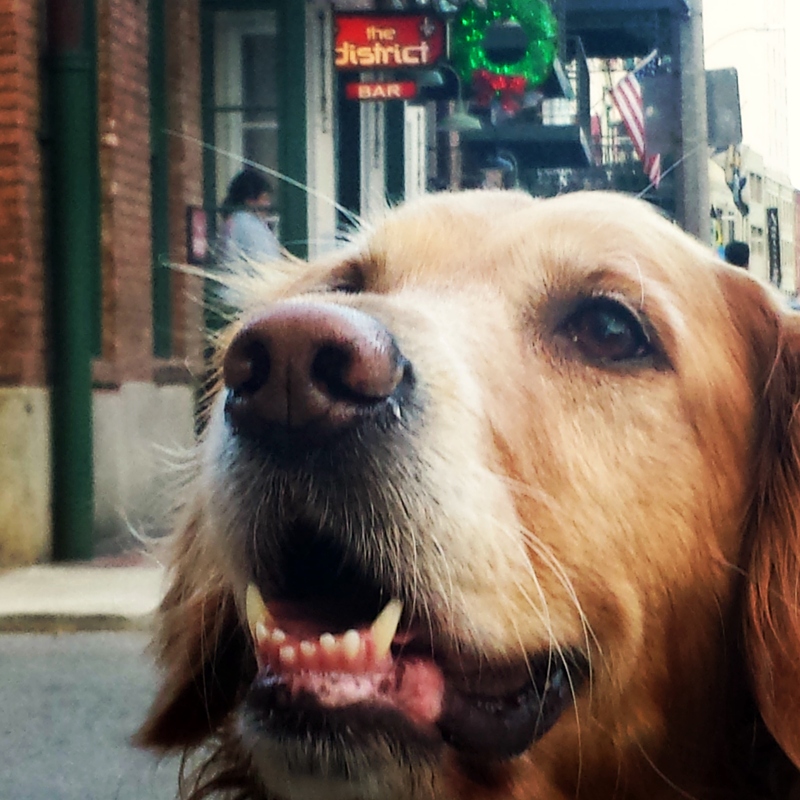 (My human mommy says that you absolutely must visit New Orleans for Christmas so that you can see the decorations in the hotel lobbies. They are truly stunning.) Our first stop was the Windsor Court Hotel. While Miss Erika and my mommy went into the lobby to enjoy the festive atmosphere, my human daddy and I waited outside in the beautiful courtyard. And that’s when the doorman uttered these magical words: “You can go inside. 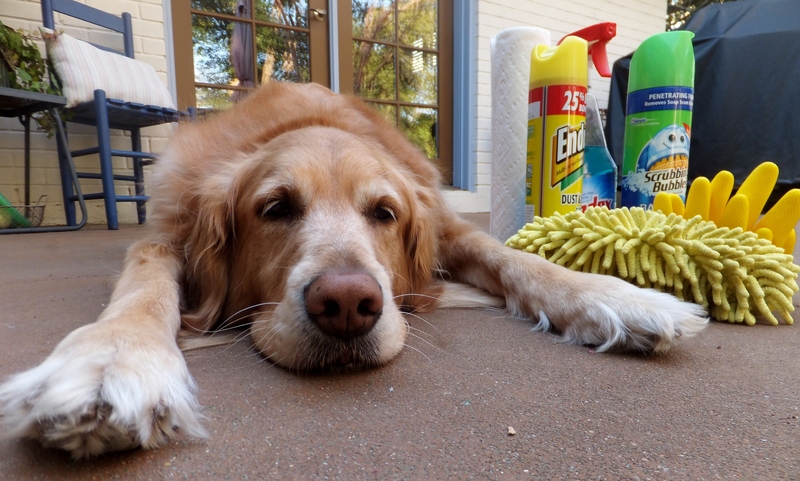 We’re completely dog friendly.” It was the poshest place I’ve ever been. 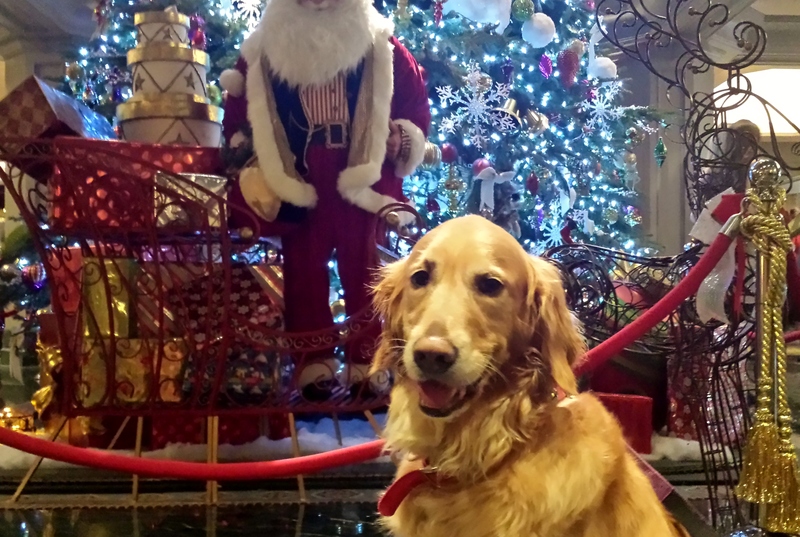 Mommy was so stunned by the fact that I could go into the lobby, she totally cut off Santa’s head in my photo in front of the Christmas tree. But it was a day I’ll always remember . . . meeting yet another of my fabulous Instagram friends, showing her my favorite spots in one of my favorite cities, and walking into the Windsor Court Hotel to see the beautiful Christmas decorations. What a perfect Second Day of Christmas! 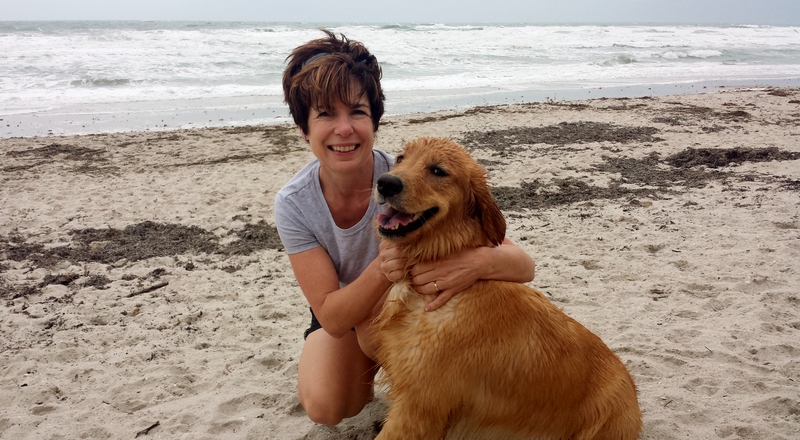 Can you believe that life got even better after my first day at the beach? Can you believe that I woke up the next morning and got to go back to the beach? And can you believe that I was joined by friends? 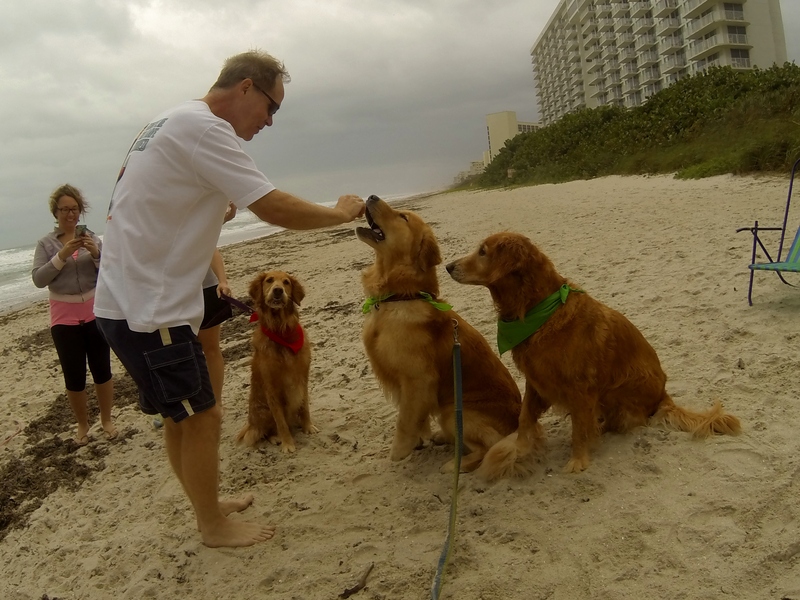 I had a Golden Beach Bash with eight of my Golden Retriever Instagram friends. It was the best day ever! 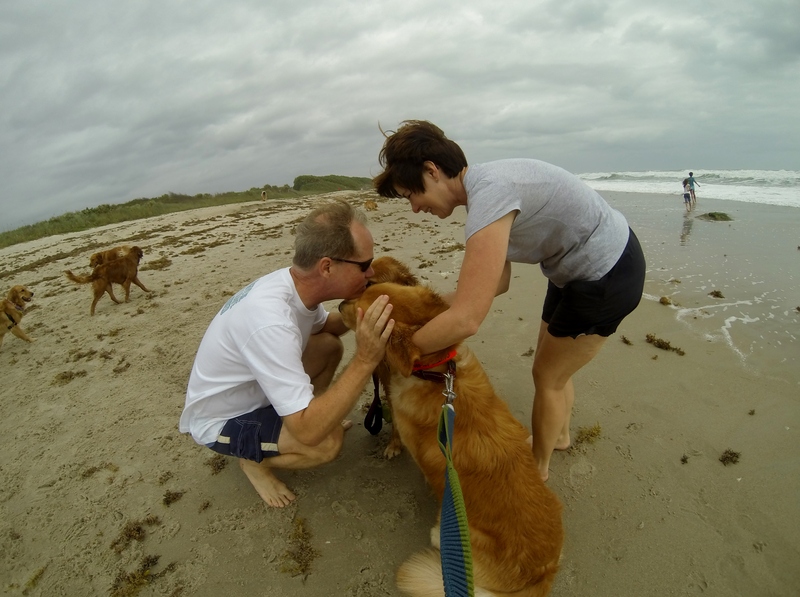 We started gathering around 11 a.m. at Canova Beach Park, the only dog-friendly beach in Brevard County, Florida. It was a little chilly, slightly overcast, a bit drizzly, and the wind was blowing like crazy. But we didn’t care. That’s Sam on the far left, Brinkley, Carter, and Cupcake. I’m the one on the right with the super happy and totally silly grin. The day was organized by my friend Carter’s mom. His mom is the hostess with the mostest. She made the fabulous reindeer bandanas for all of us. Isn’t Cater the most handsome boy ever? And why do I look like such a wet rat? Oh well, I didn’t care. I was at the beach . . . with friends . . . and it was the best day ever! And if you think I was happy, just look at my humans. I would say they were in hog heaven, but it was more like dog heaven . 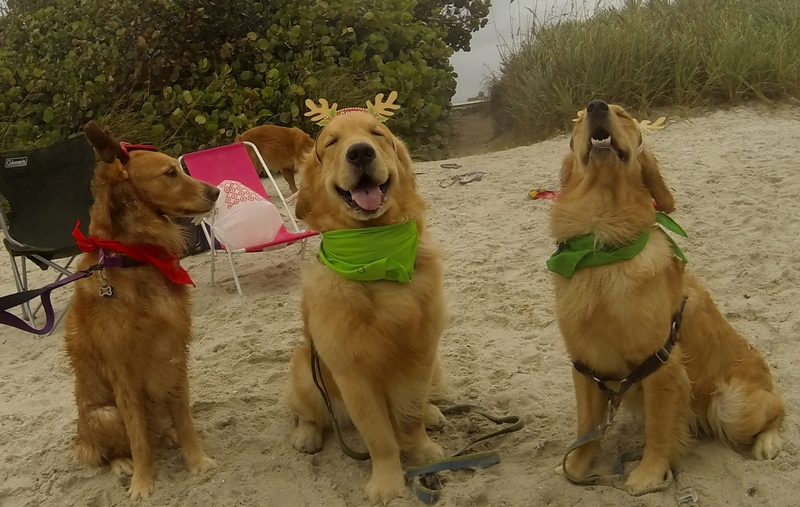 . . Golden dog heaven. That’s my daddy kissing Carter with me hidden in the background . . .
. . . and there’s my mommy with Carter and Harper Lee bookends. More than two weeks have passed since that day, and Mommy still has that smile on her face. That’s my daddy handing out treats. Carter’s in the middle getting a treat; I’m on the left; and Sam is on the right. It looks like Sam was getting ready to move closer so she could be in better treat-gathering position. I just look like I’m wondering why in the world Daddy is handing out treats to others. 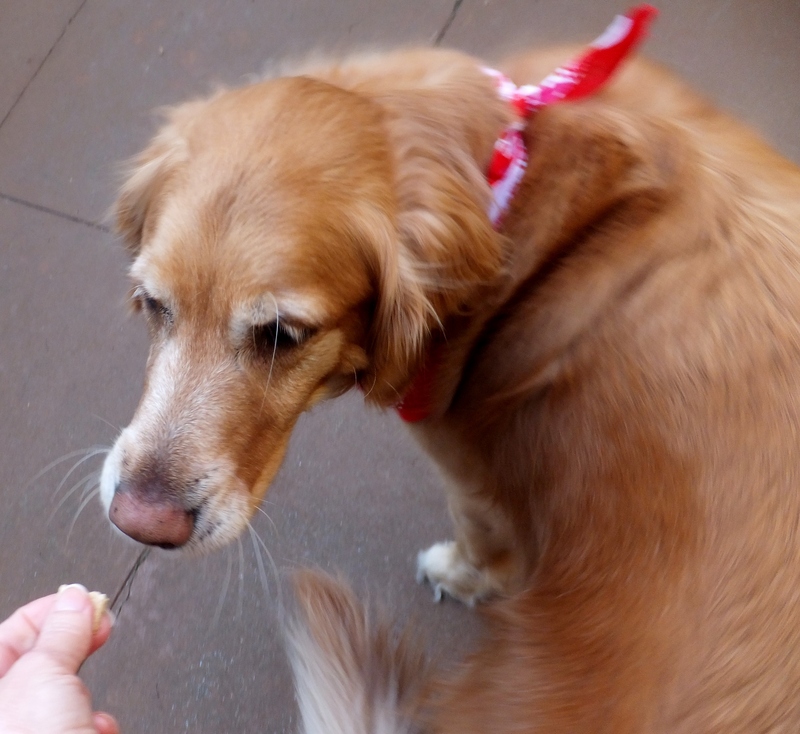 The humans distributed a lot of treats that day . . . when they weren’t snapping photos. Believe it or not, Mommy didn’t take that many pictures. She was having too much fun hugging all of my friends. That’s Brinkley. Brinkley looks just about as happy about hugs as I am. It’s not a real beach party until the new girl’s face is covered with sand. Just for the record, I was the new girl. Carter, Cupcake, and I took a quick moment to pose with our reindeer antler headbands. 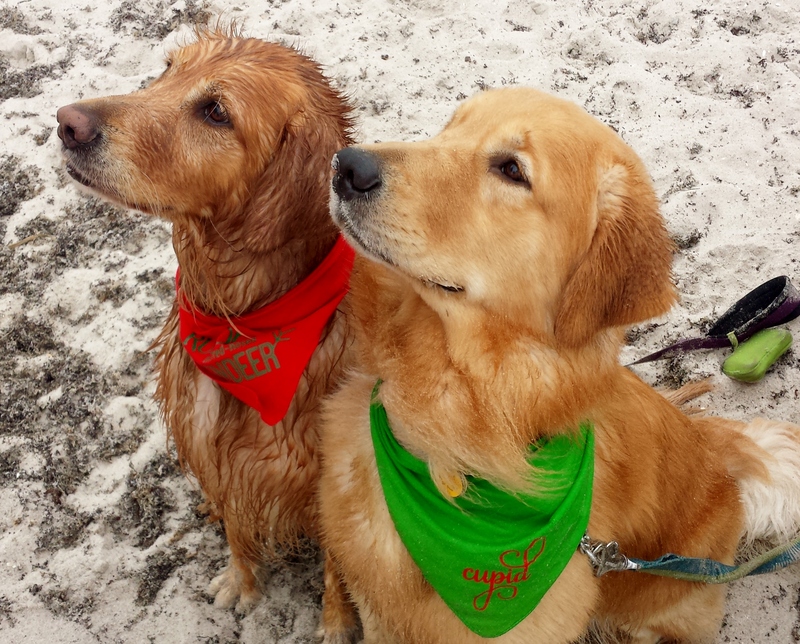 I’m on the left, looking for my daddy at the other end of the beach; Cupcake’s on the right, looking toward the sky in hopes that treats will fall; and Carter’s in the middle, looking handsome for the camera. Can you tell which one of us is the show dog? The party ended around 3 p.m. with a final group photo. Actually, the party ended with many, many, many attempts to get the perfect group photo. 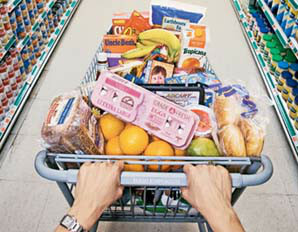 Finally, the humans abandoned any hopes for perfection and settled for fun. 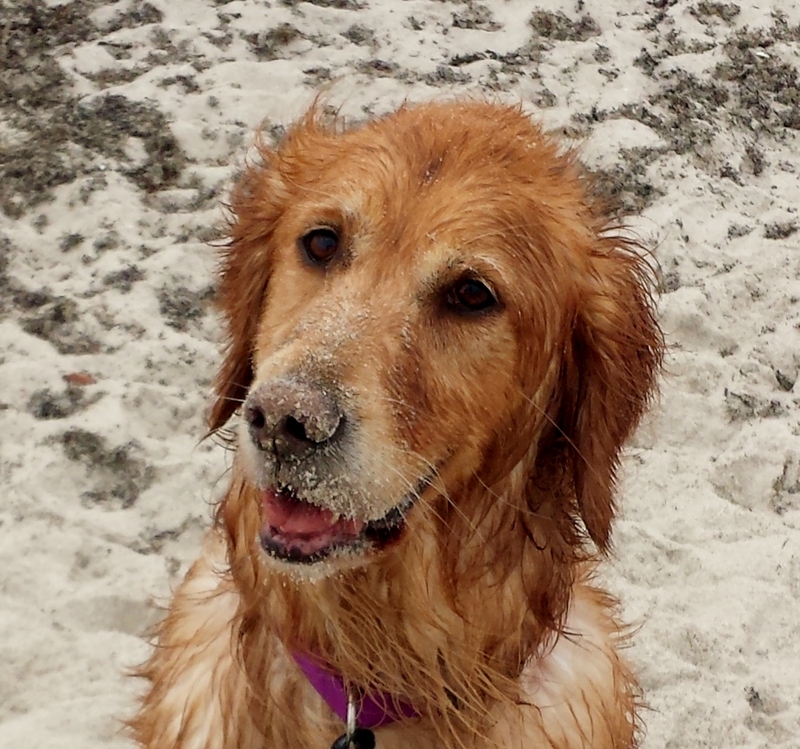 Fun is what you get with nine Golden Retrievers at the beach. 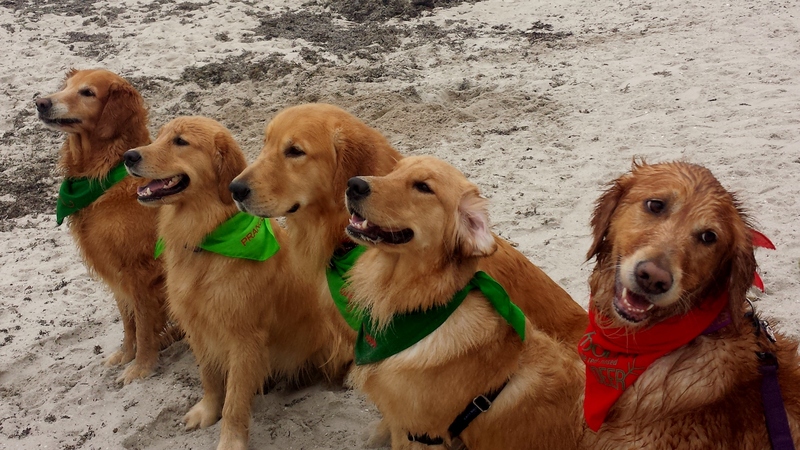 In the front row, from left to right, that’s Riley, Sam, Cupcake, Brinkley, and Glory and Katie from Lakewood Golden Retrievers. I’m in the back row with Carter in the middle and Luna on the right (Luna and Riley are sister and brother, but they have different human families). I had driven 760 miles across the Louisiana border and then through Mississippi, Alabama, and most of Florida. (Technically, I was chauffeured, but you know what I mean.) 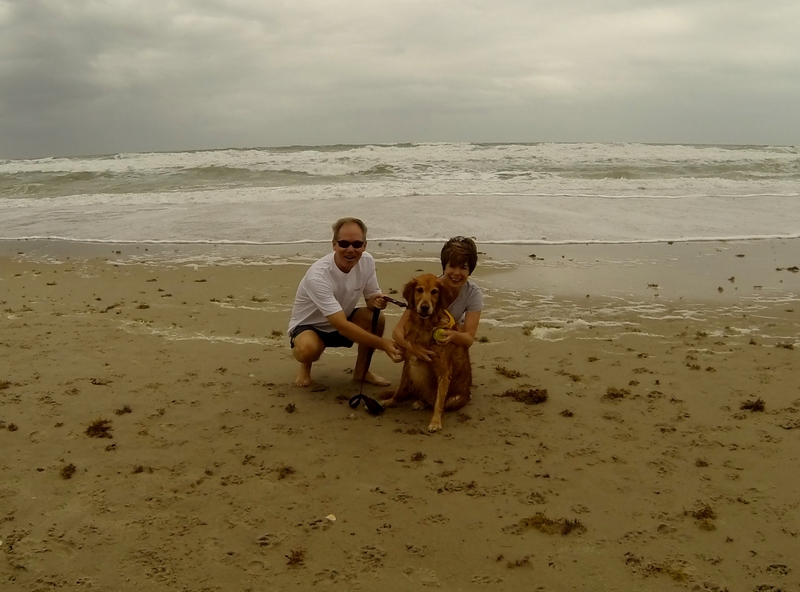 I had enjoyed a magical day in Melbourne, Florida. I put my toes in the sand and frolicked in the surf for the first time in my life. 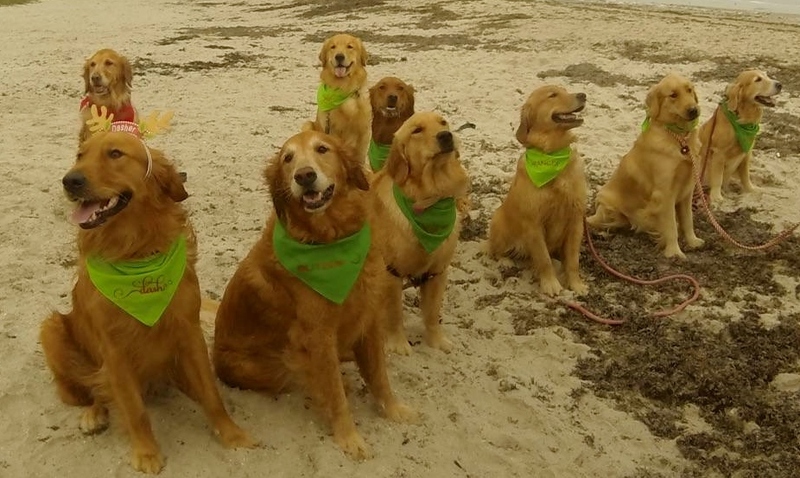 And then I got to spend a day at the beach with eight of the very best Golden Instagram friends ever. The next day, my friend Carter’s mom had a Christmas photo shoot planned for me (you’ll have to wait to see those photos). 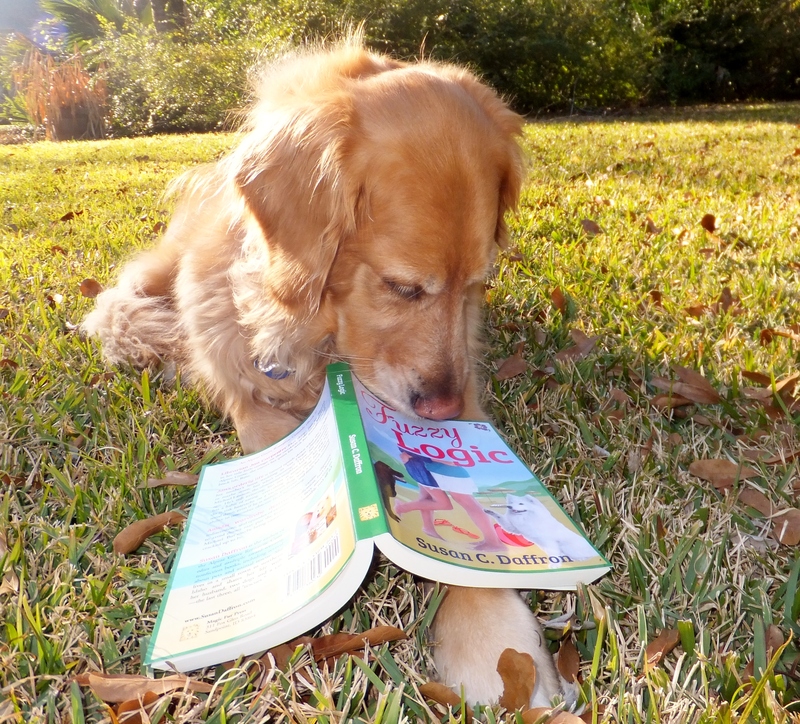 Then I would hop into the car and drive with my humans to Tampa for one night before heading back to Baton Rouge. But that night, after a wonderful day at the beach, I put my little head down, drifted off to la-la land, and had sweet dreams of my fabulous day . . . the best day ever! Yesterday I officially joined the Instagram Snake Charmers Club, which from this point on will be referred to simply as #snakecharmers. 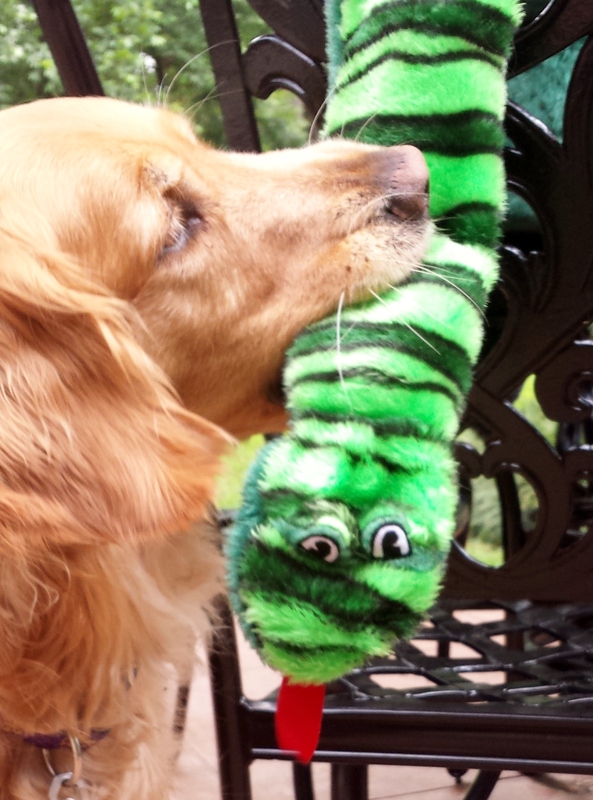 Not familiar with the #snakecharmers? If you’re on Instagram, check out the hashtag. I think the photos will tell you all you need to know. If you’re not on Instagram, I’ll do my best to explain. 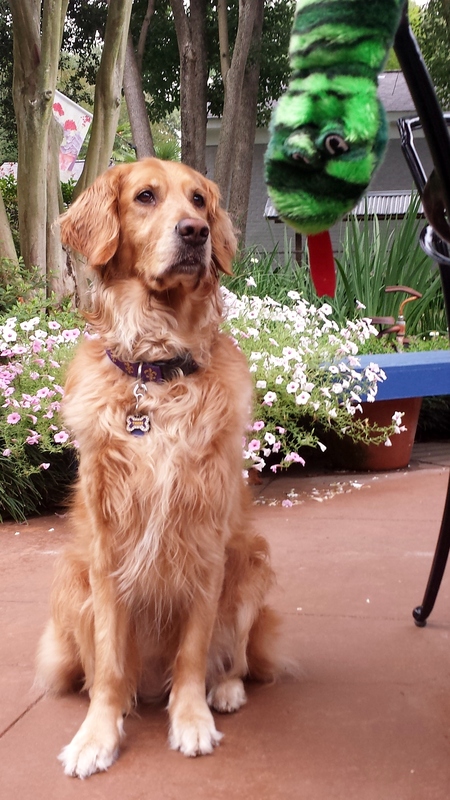 The #snakecharmers are a group of Instagram dogs with snake toys. (As of this writing, there are only dogs in the club, but I’m sure membership would be open to pigs, cats, birds, guinea pigs, etc. It’s a fairly non-exclusive club.) Sounds pretty simple so far, right? Here’s where it gets more interesting. There are various chapters of the #snakecharmers. There’s an East Coast Chapter (rumor has it the #snakecharmers originated in Florida) and a West Coast Chapter, a New England Chapter and a Midwest Chapter, a Georgia Chapter and an Arizona Chapter. There’s even a Special Ops Team and an International Chapter. I’ve heard whispers about an Undercover Chapter, but I was sworn to secrecy so my lips are sealed. But back to me. There’s nothing quite like that special moment when a girl meets her snake and the charming begins. It starts off slowly, quietly, and gently. Then a little bit of crazy kicks in and it’s best just to stand back and watch . . . from a very safe distance. And voila! The snake has been charmed. He’s so charmed that he now has a name–Sammy–and he’s slithered up beside me for a nice little nap. We all know that snakes are cold-blooded creatures, so I’m sure he appreciates a little Golden warmth. 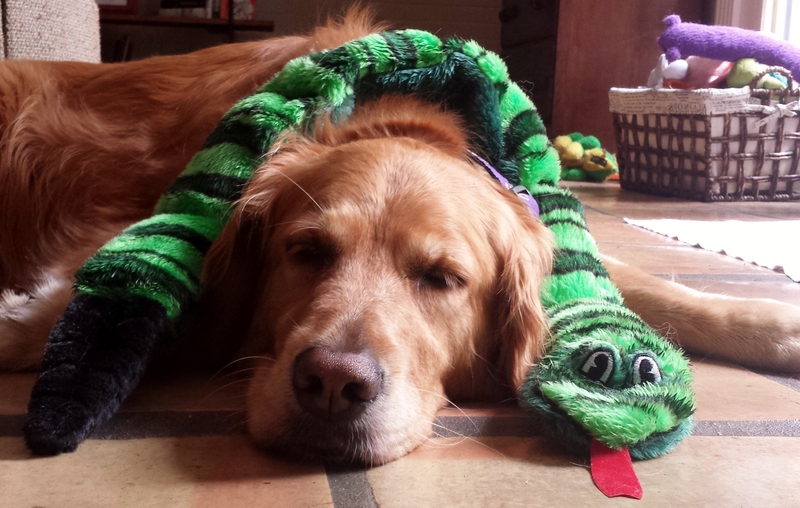 Who knew snake charming could be so exhausting? Boy am I happy that the weekend is here and I’ll have a chance to catch up on my sleep. 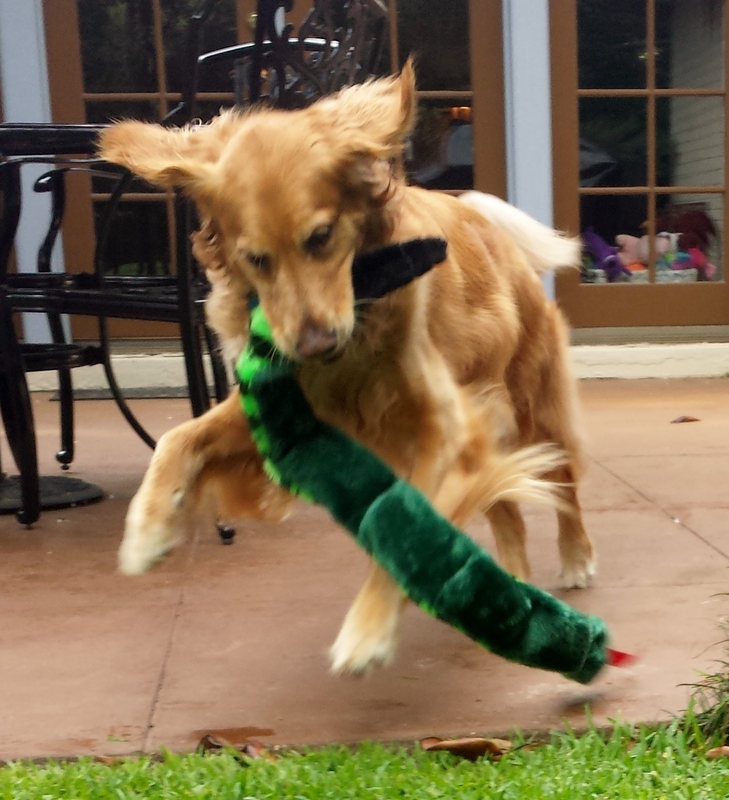 Many, many thanks to my sweet Instagram friend @johnanng and the 3 Crazy Retrievers for introducing me to the #snakecharmers. The club started just a week ago, and it’s growing by leaps and bounds. What do you say? 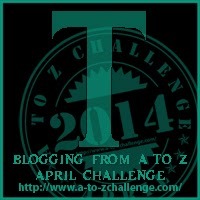 Any interest from the blogging community? I have an awesome tongue. Even my human mommy, who does not like the word awesome, thinks that I have an awesome tongue. Sometimes my humans look at my tongue hanging out of my mouth and think to themselves, “Where does she keep that thing?” They wonder if perhaps I might be part giraffe, especially when I fully extend my lovely tongue and wrap it around my cute pink nose. Once a week on Instagram, I get to celebrate my tongue on Tongue out Tuesday, also known as #tongueouttuesday. 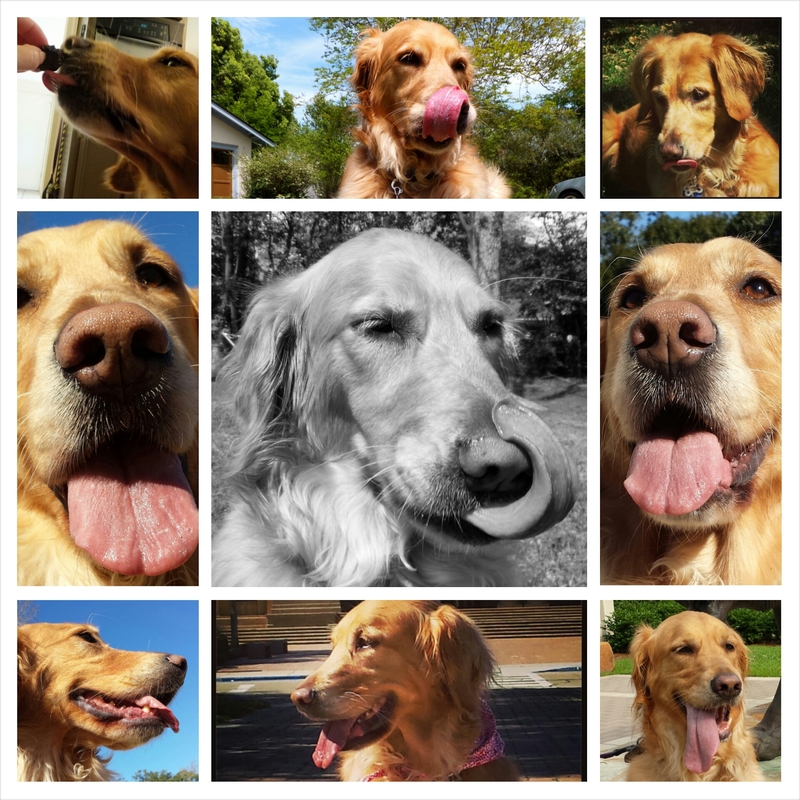 Here is a compilation of just a few of my Instagram #tongueouttuesday photos.